Pediatric Partial | Smile Angels of Beverly Hills - Bruce Vafa DDS. 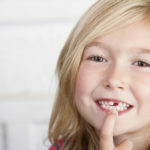 The idea of a child needing to have a dental partial may seem foreign to many people. 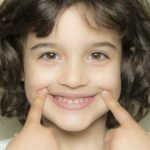 There are a number of good reasons have your child fitted for a partial as a matter of cosmetic dentistry, but even more, very important child development issues that are associated with having a pediatric partial. A child may lose their teeth at an early age due to tooth decay or an accident that results in teeth being broken or chipped. Specifically regarding the front teeth, most children will not lose these teeth until age seven when they will naturally fall out. Should these teeth be damaged before then, the child will have an important part of their self-esteem negatively affected. Beyond the child’s appearance, the early loss of front teeth can affect chewing and eating habits that will last for years. Pediatric partials are intended to be a temporary solution until nature resumes its course, allowing the child and the parent to resume partial-free, normal lifestyles. Dr. Bruce Vafa brings nearly 25 years of dental experience in restoring the natural smiles of patients using state-of-the-art techniques and technologies to the Los Angeles and Beverly Hills communities. Before considering taking the step to scheduling an appointment to see if a pediatric partial is the right solution for you, the benefits of the procedure should be evaluated. Each benefit should be carefully weighed, and then an appointment should be scheduled to combine your own knowledge with that of a dental professional. Also known as pedi-partials, their most obvious benefit is that the child’s smile is aesthetically pleasing to themselves and to others. What is more important to the long term dental health of the child is that partials prevent the teeth next to the damaged teeth from growing in crooked. The overall foundational dental structure of the child can also be affected, sometimes with long term, negative consequences. Changes in speech patterns can also occur when the missing teeth are not repaired. From a dental health perspective, all of these potential problems can be avoided with a properly designed and fitted pedi-partial. When weighing the benefits and making a final decision, ask yourself if your child is the same smiling, happy, self-confident person that they were before their teeth were damaged. Now add to that your parental concern and responsibility for their long term dental health. Once these unique truths are combined with the major benefits of a pedi-partial, the answer will be obvious. After consulting with a dental professional and discussing the procedure, your child will visit the dentist to have the affected baby teeth removed. A mold will be made of the child’s mouth to act as a blueprint for the laboratory to create a plastic pedi-partial specifically fitted to their mouth. Then the partial is sent to the dentist to complete the fitting. A second appointment is made to fit the partial into the child’s mouth. Minor adjustments are made by the dentist too ensure the partial fits exactly and there are no points of discomfort for the child. Once the adjustments are completed, the partial will be cemented into the child’s mouth. Unlike an adult partial, the pedi-partial will remain in the child’s mouth until their permanent teeth begin to show themselves, at which point the partial is removed and the normal process of growing new teeth is allowed to occur. Though the process is complete once the partial is fitted and set in place, the temporary teeth require care and maintenance during the time your child wears them. One reason is that like normal teeth, food can get caught between the teeth, which will result in a build up of plaque. A build up of plaque can be the start of other dental problems that affect the gums and surrounding teeth. Daily brushing is essential as a preventative measure as long as the partial is in place. It is important to pay attention to the areas around the area of the partial. Brushing may sometimes cause bleeding, and this is often a situation where the mouth and gums are inflamed and are adjusting to the presence of the partial. This period of bleeding should not last long, and the bleeding is not a reason to stop brushing the area. In time, the inflammation will go down and the bleeding will stop. Finally, the child may experience a degree of discomfort or pressure from the partial as they go through the initial period of adjustment. This is normal and natural. However, if there is persistent bleeding or discomfort, then you need to call and make an appointment to see Dr. Vafa so any necessary adjustments can be made. Our greatest concern is the health and well-being of your child. We work to promote a natural smile and the long term dental health of all of our patients. You are encouraged to ask any questions or bring any concerns to our attention as needed.